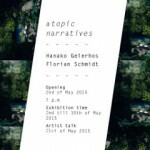 Vesselroom Project is delighted to present during Gallery Weekend the collaborative show Atopic Narratives by the artists Hanako Geierhos (D) and Florian Schmidt (A), which will open on Saturday, 2nd of May 2015 at 7 p.m. Using their individual artistic practices – performative sculpture and sculptural painting – Hanako Geierhos and Florian Schmidt collaborate this time together on a unique and significant show, connected by an acute interest in alternative constructions of space and the infinite possibilities of forms that can emerge from them. Atopic Narratives is their first duo-show in Vesselroom Project. Their exhibited works open up questions about the status of public, private and social space (Geierhos) and the meaning of objects and paintings (Schmidt) in an atopic society. Their common aim is to exceed boundaries through an ambiguous outline of their individual works with the further intention of unveiling the space that lays beyond the absoluteness of predominant perception. Four different and at once synchronized bodies of work will be included in the exhibition space: Vela, Transitory Rituals (H.Geierhos) and Structure, Community (F.Schmidt). Hanako Geierhos explores art as an instrument of communication and a platform for articulation of sensory experience, different forms of social interaction and individual/collective perception of space. Florian Schmidt creates pictorial frames through which he is exploring the relation of space, material and color. This research results in two-dimensional works for the wall and freestanding sculptures. In addition to their individual art practice Geierhos and Schmidt collaborated since 2006 together in various group-exhibitions at Gallery 400, University of Illinois at Chicago (2013), Autocenter, Berlin (2009), Body Navigation Festival, St. Petersburg (2008) and Real Presence, Belgrade (2006).